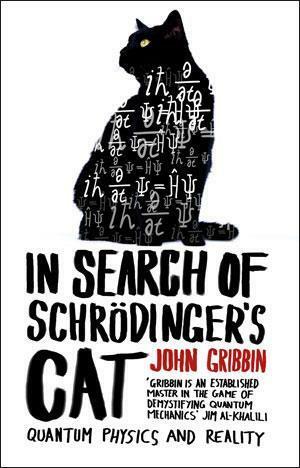 In search of Schrödinger’s cat is a book about how scientists struggled to describe what the nature of reality is really like. There are few bigger questions than that, and along with tales of the great men who have worked on the puzzle, it makes a compelling story. If, like me, you’ve read quite a bit about quantum mechanics, but have not got to grips properly with how particle physics works, then this book could be for you. However, it is not for the faint-hearted. Gribbin simplifies the material substantially, but this book is about explaining the science, not merely popularising it. You’ll find equations, technical language and Feynman diagrams aplenty within these pages; there were several occasions where I was not so much reading this book, as intensely studying it. The book is definitely enjoyable though, and I found it un-put-downable in the early chapters. Gribbin comments on how difficult it is to trace a narrative history through the piecemeal development of quantum theory, but he manages to craft his story excellently, nonetheless. Gribbin’s analogies were possibly the best bit for me. They seemed fresh and understandable. His treatment of observing quantised photons coming out of a nucleus as being like observing banknotes coming out of a cash machine was an excellent example. Do we see £10 notes coming out because that is the lowest possible denomination, or is it just the way the machine works? Gribbin frequently writes in the first person, and appears to have put a lot of himself into the book, (even describing which of his favourite science fiction are the most useful for understanding time travel). Luckily for the reader Gribbin is a formidable thinker, and his opinions carry weighty and useful insights, which significantly aid understanding. The subtitle of this book is ‘quantum physics and reality’. With such a grand theme, perhaps it is no surprise that the result is a complex, personal, at times controversial, and always interesting read. Purchase this book on Amazon.co.uk.